Home Off Beat	Hello Kitty Samurai Tattoo: Feline marches on! I donât like Hello Kitty. As a matter of fact I have never liked her. There you have it. Happy? 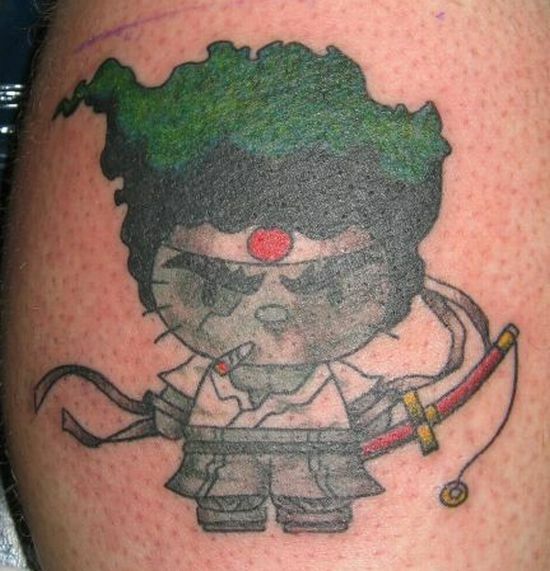 With that off my chest, I can go on and write a bit of diatribe on a Hello Kitty Afro Samurai Tattoo that you see above. Regardless of my stance, chicks obviously dig into this feline cartoon and this (and hundreds of thousands of other) tattoo is a clear illustration. The tattoo in question shows the cute cartoon character in an evil avatar. Of course, weâve had Hello Kitty in every possible form, so why not a tough one. And the depiction is justified enough, at least for me. After all Hello Kitty is out wreaking havoc on easily misled womenfolk of our times (Yeah you wish!). Mark my words ladies this is the true self of the cute character. By the way does anyone seriously think before getting such a tattoo? Only way I could conceive anyone getting this inked is in a condition known as stoned! Fetus tattoo-Conveying a silent message! ← What does your tattoo say!